Molecular imprinting is an emerging technique to create imprinted polymers that can be applied in affinity-based separation, in particular, biomimetic sensors. In this study, the matrix of siloxane bonds prepared from the polycondensation of hydrolyzed tetraethoxysilane (TEOS) was employed as the inorganic monomer for the formation of a creatinine (Cre)-based molecularly imprinted polymer (MIP). Doped aluminium ion (Al3+) was used as the functional cross-linker that generated Lewis acid sites in the confined silica matrix to interact with Cre via sharing of lone pair electrons. Surface morphologies and pore characteristics of the synthesized MIP were determined by field emission scanning electron microscopy (FESEM) and Brunauer-Emmet-Teller (BET) analyses, respectively. 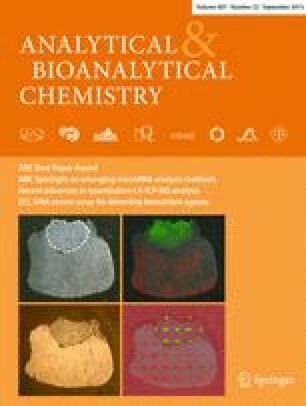 The imprinting efficiency of MIPs was then evaluated through the adsorption of Cre with regard to molar ratios of Al3+. A Cre adsorption capacity of up to 17.40 mg Cre g–1 MIP was obtained and adsorption selectivity of Cre to its analogues creatine (Cr) and N-hydroxysuccinimide (N-hyd) were found to be 3.90 ± 0.61 and 4.17 ± 3.09, respectively. Of all the studied MIP systems, chemisorption was predicted as the rate-limiting step in the binding of Cre. The pseudo-second-order chemical reaction kinetic provides the best correlation of the experimental data. Furthermore, the equilibrium adsorption capacity of MIP fit well with a Freundlich isotherm (R 2 = 0.98) in which the heterogeneous surface was defined. The authors gratefully acknowledge financial support from The Institution of Higher Education FRGS Grant (6071251), ScienceFund (6013393), and Membrane Science and Technology Cluster. Q.Y. Ang is financially assisted by the Ministry of Higher Education (MOHE) and Universiti Malaysia Perlis (UniMAP).